Just Listed :: Beautiful Traditional in Vinings Place! Welcome Home! Located in one of Mableton’s most popular swim/tennis neighborhoods, this home is just what you’ve been looking for. The flowing floor plan, custom features, and charming character will never go out of style. The close proximity to I-285 and I-75 makes this home convenient to and from any direction. You’ll also have easy access to the other highways, byways, and activities that make this location such a well loved destination. 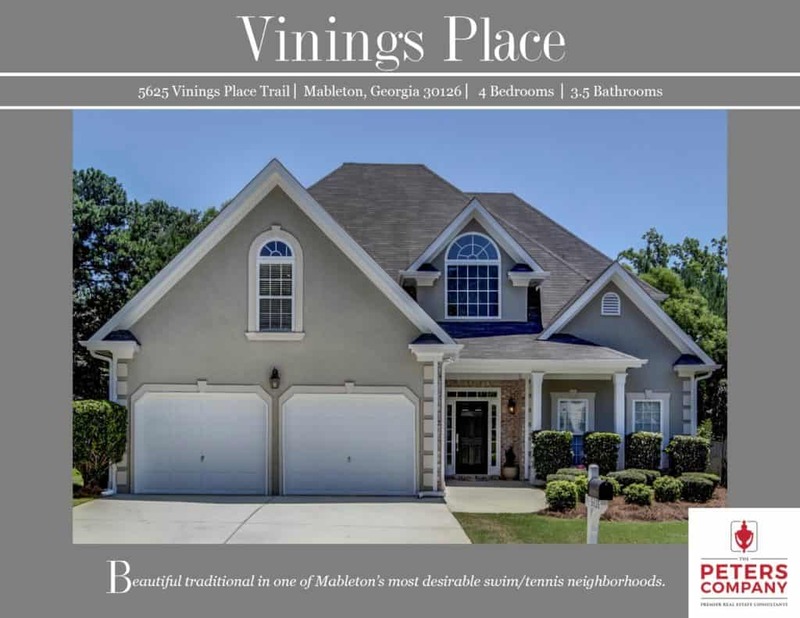 You will certainly enjoy being only a short drive from several area parks, the 61-mile long Silver Comet Trail, and the new SunTrust Field (future home of the Atlanta Braves)! Kitchen features tons of cabinet space, granite counters, recessed lighting, spacious pantry, breakfast bar, and breakfast area with bay window. Amazing keeping room off kitchen has an exposed beam ceiling and fireplace with stacked stone surround. Separate dining room is perfect for entertaining guests or hosting holiday gatherings. Spacious family room has a cozy fireplace and vaulted ceiling. Master on main is a true retreat including a trey ceiling, oversized walk-in closet, and dual sided fireplace. Spa-like master bathroom has a double vanity, large tub, and separate shower. Additional bedrooms are well sized and bright including a second master bedroom upstairs. Large bonus room/4th bedroom could also be used as a playroom, media room, or home office. Great outdoor space includes a patio overlooking the flat, fenced backyard. Wonderful neighborhood amenities including a swimming pool, tennis courts, and playground.